Bigfoot Mountain Guides: Cannon Goes Off! Ice climbing is a little like surfing. An exceptional storm can create the “perfect” set of conditions. Once the word is out that conditions are good a crowd of devotees won't be far behind. As a winter venue, Cannon Cliff only comes into shape after heavy rain followed by an intense cold snap. These conditions, which are common at either end of the season, don't last long. 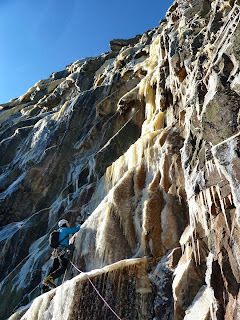 The sunny clear conditions that frequently accompany the post-rain cold snap are all that's needed to delaminate any thinner, climbable ice on Cannon, even if it's only fifteen degrees outside. Last Saturday I went to Grafton Notch with my friend Erik Eisele. We got skunked; the Hackett-Tremblay, which was nearly in shape the weekend before, had literally disappeared. We spent the remainder of the day getting bouted on one of Erik's mixed projects in northern New Hampshire. Sunday Erik went to Cannon, where he and his partner had the cliff to themselves. He took some photos throughout the day and posted them on NEIce and Facebook that evening. The photos were of a very fat Fafnir, Hassigs and Black Dike, and of Mean Streak and Omega. The routes looked healthy, a rarity during a normal season and an absolute anomaly during an almost non-existent season like the one we're currently experiencing. By 7:30 the following morning (Monday) multiple parties had made plans to climb at Cannon on Tuesday. Michael Wejchert, Elliott Gaddy and I arrived at the Cannon parking lot at 7:30 Tuesday. There were already 5 cars in the parking lot, and while we were racking up there two more vehicles arrived. We approached as for the Black Dike and traversed left below the cliff toward the Omega amphitheater. Near the base we bumped into Bayard Russell, Freddie Wilkinson and Matt McCormick racking up for Mean Streak. 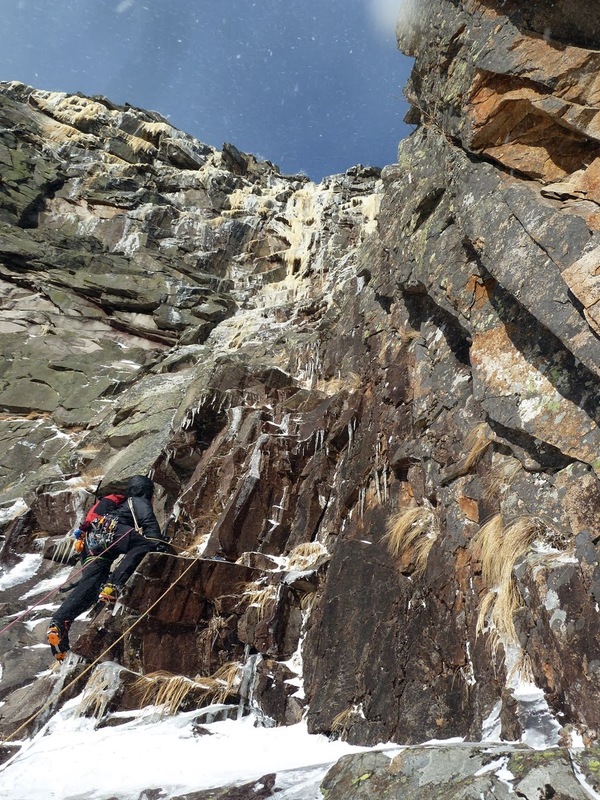 This challenging route has seen only a handful of ascents and involves continuously steep and challenging climbing. With no one else in the amphitheater besides the party on Mean Streak we headed for Omega. Elliott, Michael and I have all tried Omega before. Not only is Omega a challenging ice climb, it's a tough route to catch in the right conditions. 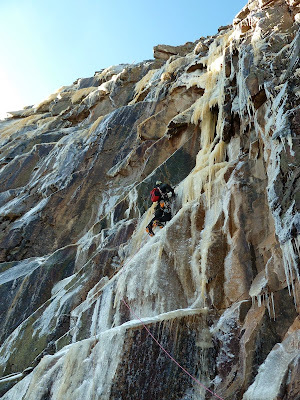 Like all other Cannon routes that involve thin ice climbing, getting to the climb before the sun delaminates all of the ice might be the biggest challenge. Elliott won the three-way rock-paper-scissors, and started up a rock and turf ramp to the right of the ice. 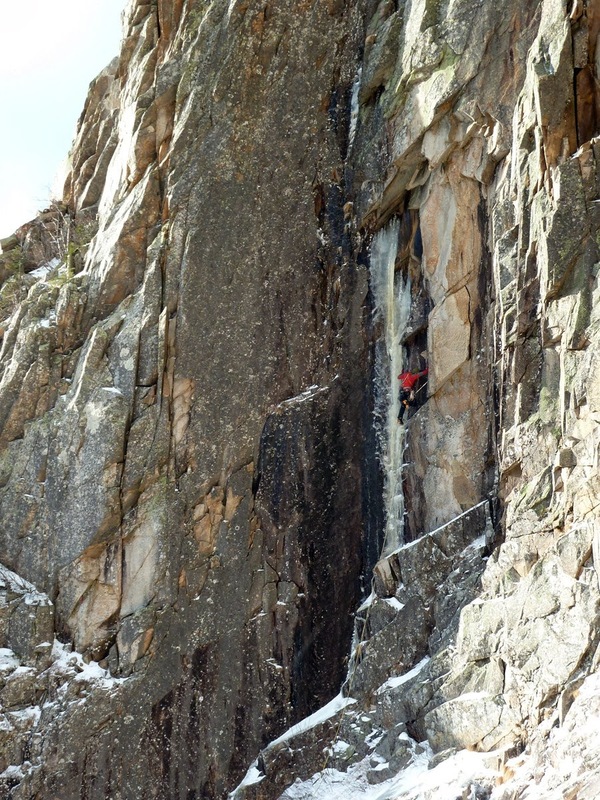 The lower half of Omega rarely has enough ice to be climbable. Rock climbing with crampons on the blank, slabby granite found at Cannon is an experience everyone should try at least once. Turn your points the wrong way and your feet will go skating off the sloped ledges. Turf shots are less abundant and always less substantial than one hopes as well, making even easy mixed climbing feel really challenging. Elliott's lead turned out to be more challenging than it looked, and had less protection than is normally desirable. It was an impressive way to start the season. 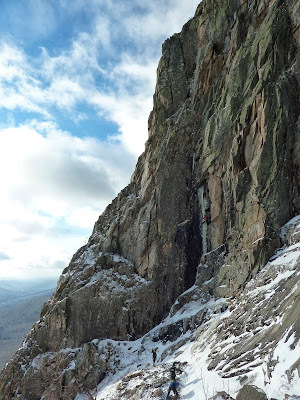 I took over at the belay and led up a fun well-protected rock pitch which ended on the halfway ledge, where the ice begins to get more abundant. Michael and Elliott were at the belay in no time. Michael, who's climbed more ice terrain than mixed terrain, took over at this point and led up steep thin ice to a slabby ledge above. As he stood on the ledge trying to find solid tool placements the hollow, unbonded 2-inch thick ice slab creaked and groaned. Michael decided the climbing above was more than he wanted to deal with. After a few sketchy moves back down, he was safe on the ledge. Elliott gave the pitch a go next. 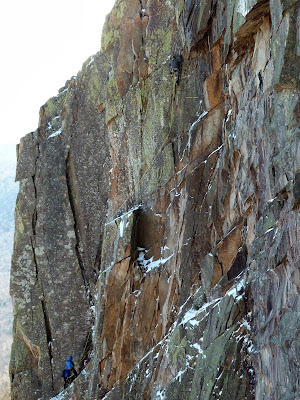 He climbed a few feet higher and managed to find two fixed pitons on the right wall of the corner. 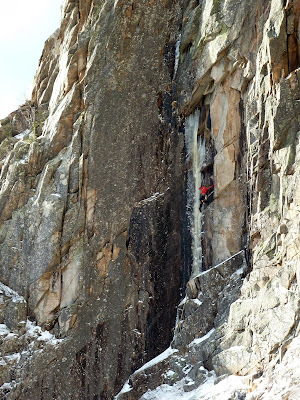 Above that, the thin ice of the crux was both unprotectable and not well bonded. After lowering off the two fixed pitons we decided to rappel. I didn't need to try the crux ice pitch as well to decide that leading a full pitch of hollow, unbonded ice was a risky proposition. Safely back on the ground, we realized that not succeeding isn't the worst thing. It gives us a reason to come back, try again, and wander up what might be the East Coast's finest alpine venue.